Exciting News - Sophia Webster is launching a Kids collection! Forgive me for my excitement overload but while I was browsing the website of my latest designer shoe obsession, Sophia Webster, I saw an ad announcing a brand new line of shoes and these little darlings are for "kids"!! With most of my girlfriends in the later stages of pregnancy I'm very excited by the opportunity of being able to buy their little bundles of joy their first pair of 'Sophia Webster Mini' shoes!! Ok so I know I'm not normally one to advocate the buying of designer clothes for children, which I agree grow very fast, or for turning children into mini-me's. However these beautiful sandals and shoes can also become a memento, maybe even a piece of art? Who wouldn't want a framed Sophia Webster shoe to adorn your nursery wall? As soon as a launch date is announced I will let you all know via my social media channels. Be sure to follow me on twitter, Instagram, Pinterest or Facebook to receive the news promptly! 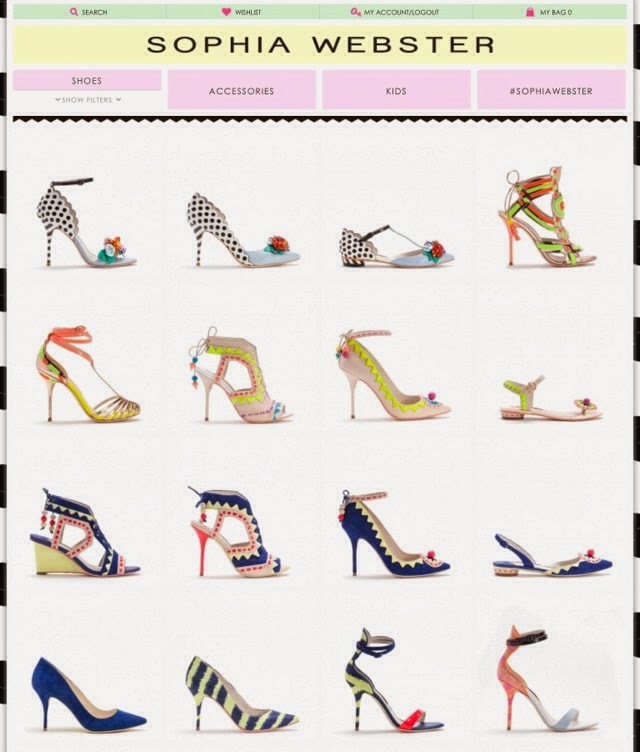 To remind yourself on how irresistible Sophia Webster's main collection is, glance below at this shot from the website! Although I accept no blame for your impulse purchases!